Welcome to Weaver Coin & Currency Auction! 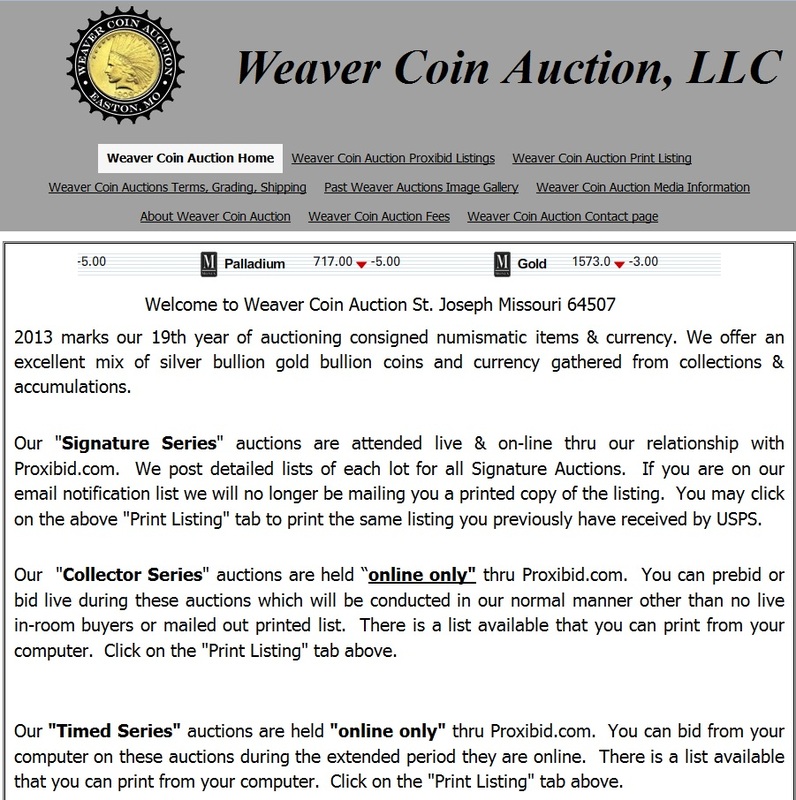 Be sure to check out the next Weaver Coin Auction on Proxibid, scheduled for March 10! Weaver Signature Coin and Currency Auction has remained one of Proxiblog’s top houses for three years running, primarily because owners Cheryl and Dave Weaver combine talents in communication and numismatics with a rich history in the auctioneering business. Weaver Auction is family owned in its 19th year of specializing in selling coins, currency and other numismatic items. The company ranks among the top numismatic sellers on Proxibid (six badges!) for good reason. Their consignments excel. They promote their auctions expertly in concise email advertising. They have low or tiered online buyer’s fees. They specialize in customer service. They ship quickly and inexpensively. Their photography is sharp, expandable and exceptional. They also treat their consignors with extraordinary service, sending checks within one week and sending consignment lists for good record-keeping. Proxiblog buys and sells with the Weavers. Another reason for the Weavers’ success is their ability to convey via Internet the excitement of an onsite auction. Their staff is on hand not only to call auctions and serve those in attendance but also to fix technology glitches and insure a safe, secure and trustworthy online experience. The Weavers pride themselves on many long-term customers who have been attending their auctions for years. More important, they also appreciate equally as well their hundreds of online customers. Dave Weaver, a graduate of the Missouri Auction School, is a licensed auctioneer. Cheryl is the “detail” half of this combo with emphasis on accuracy, scheduling and communication. The Weavers are members of The American Numismatic Association, National Auctioneer Association and the Missouri Professional Auctioneer Association. We thank Weaver Coin and Currency Auction for sponsoring Proxiblog’s scholarship fund to help ease student debt and create the next generation of auction-house bidders! This entry was posted in The Block, Uncategorized and tagged Weaver Signature Coin and Currency Auction. Bookmark the permalink.